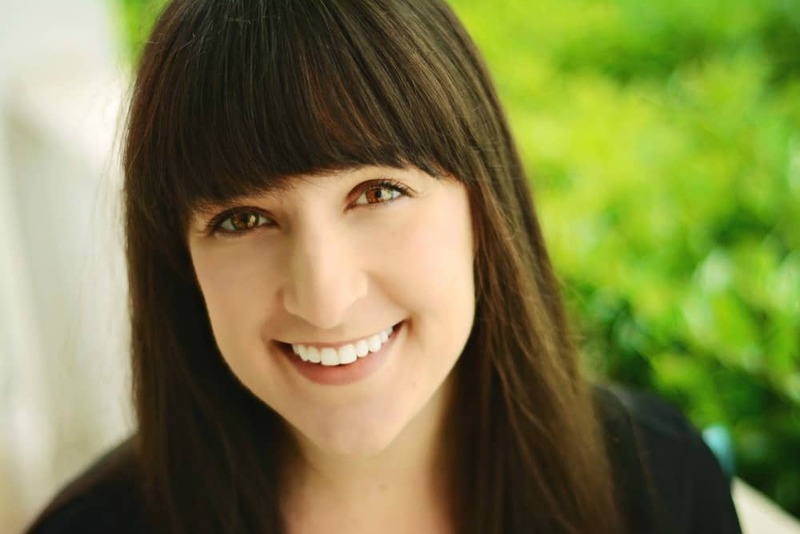 July 22, 2018 By Liz 33 Comments Note: This post may contain affiliate links. 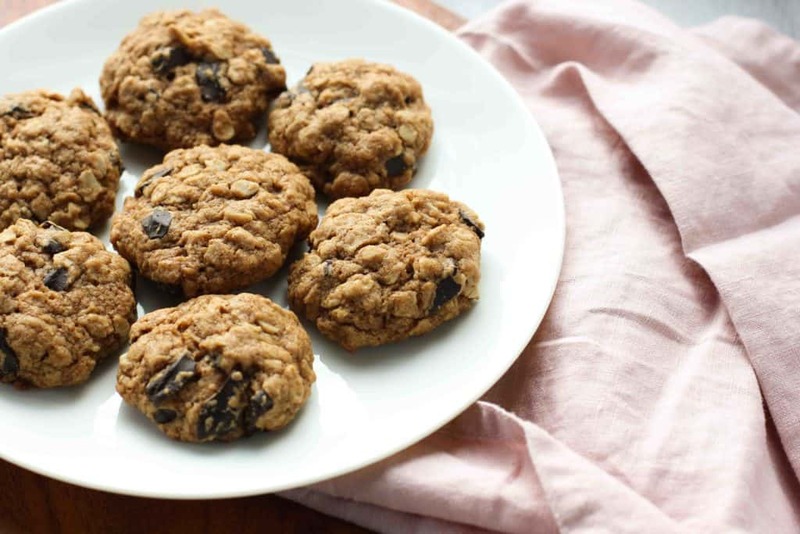 These healthier oatmeal cookies are made with whole wheat flour and oats. 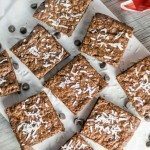 They’re just as delicious as your favorite chewy oatmeal cookies, but with healthier ingredients! Let’s be honest here. These oatmeal cookies are cookies. Yes, they’re made with oatmeal. Yes, they have lots of healthy fats in them. But… they’re still cookies. 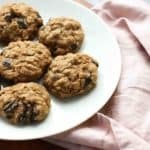 These healthier oatmeal cookies are delicious, and they’re better for you than a lot of other desserts. So let’s call it even. I love to bake when I need to de-stress and clear my head from the zillions of e-mails and lines on my to-do list. Nothing calms me down like throwing on an apron and making a mess. So I spied the giant bag of oats sitting in my cabinet and went to work. I definitely needed something with a little chocolate, but I tried to keep this light, while still making it delicious. I like using coconut sugar because it’s a little less refined, but it’s still sugar. If you want to swap in brown sugar, that’s totally fine. Any chocolate chips are delicious but I like using dark chocolate chips because it gives you a richer flavor. Semi-sweet is tasty as well! I bake my cookies on parchment paper because I don’t want to worry about them sticking to the pan. If you don’t use parchment paper, make sure you use a nonstick baking tray. 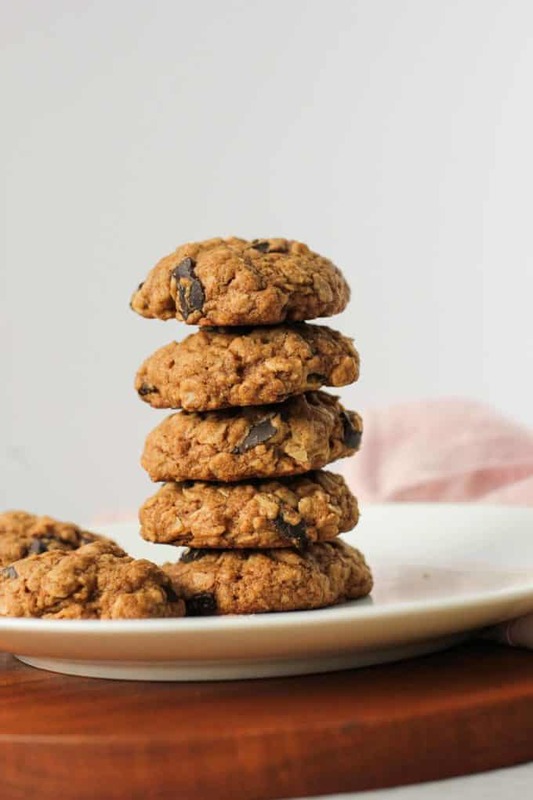 These oatmeal cookies are a healthier twist on a classic, made whole wheat flour and whole grain oats! Combine the sugar, oil, egg white, and vanilla together. Then add in the salt, baking soda, oats and flour and mix until combined. Drop in rounded tablespoons onto a cookie sheet. I usually make about 10 medium sized cookies. Bake for 9-11 minutes or until lightly browned. Let cool slightly, then transfer from the baking sheet to a cooling rack. This makes a small batch of cookies, usually between 8-10 depending on the size of the cookies. 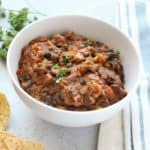 You can double this recipe if you want to make a bigger batch! These are so deliciously chewy. Chocolate chip oatmeal cookies might be my favorite cookie ever. Dig in, and remind yourself that while you’re eating a cookie, you’re also eating whole grains and all that. Looking for another healthier cookie recipe? These peanut butter cookies are one of my favorites! This post was originally published in November 2013. Updated July 2018. I looove chocolate chip oatmeal cookies. My husband makes his recipe at least once a week. They are SO good and in no way healthy. 🙂 I also really love a good butter cookie, melts in your mouth! These sounds great, Liz. I’m always up for some cookies! My favorite is definitely the plain chocolate chip cookie, but it has to be super soft and gooey! These sound great! Definitely healthier than most cookies. I love chocolate chip cookies and peanut butter cookies the best! These look delightful!! And it’s all about balance!! 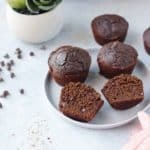 These look healthy and tasty!! Great combo!! I discovered a good trick for keeping brown sugar soft.. I put a few pieces of bread in the container with the sugar and it keeps it soft! Just switch the bread every few days/weeks (depending on how often you use it). Love that tip for getting it soft again! Healthy, not healthy, healthy(ish) – don’t matter. I could eat a whole batch of these delicious cookies! Another way to keep brown sugar soft is to put a piece of white bread in the sugar bag! These cookies look great, I love oatmeal cookies. Thanks for the tip on softening brown sugar! I have wasted quite a few bags because of that too. I love original chocolate chip chewy gooey cookies the best although I make a mean oatmeal raisin chocolate chip! 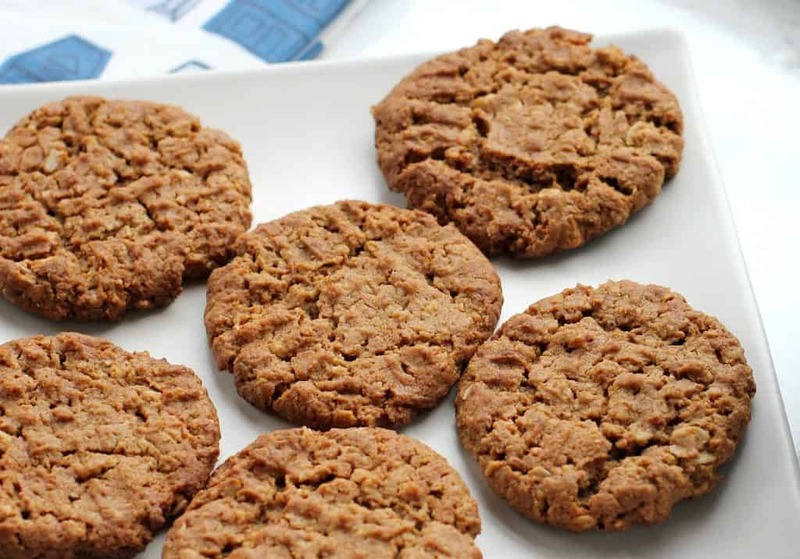 Definitely a toss up between an oatmeal cookie and a snickerdoodle…how bout a fusion of both? Wheels have started turning in my head! Ohhh that sounds like it could be an amazing combo! I love the “sort of” part! 😉 These sounds super tasty, healthy or not. I LOVE oatmeal in my cookies :). 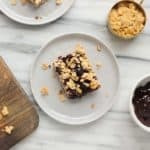 I love how it gives cookies such a chewy, hearty texture! Chocolate chip cookies or Florentines would probably be my favourite. 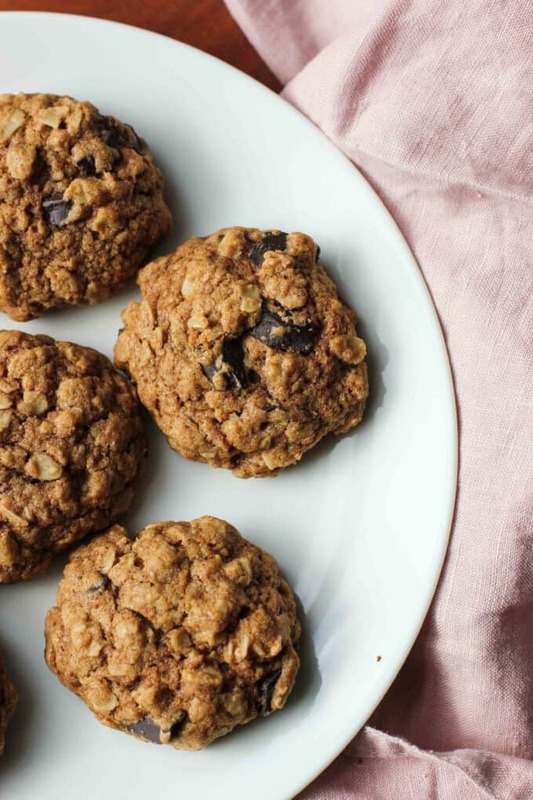 Oatmeal and chocolate chip—I’d eat these for breakfast, lunch, or dinner…forget dessert ;)! I seriously adore chocolate chip peanut butter oatmeal cookies. They contain everything I love. Although white chocolate cranberry oatmeal cookies are also pretty bomb. I just love the heftiness of a good oat cookie! Mmm anything with chocolate and peanut butter is good with me! Chocolate chip/potato chip?! Why have I not tried that?! You can also add a piece of bread to your brown sugar container to soften it. 🙂 I hadn’t heard of the microwave suggestion before so I’ll have to keep it in mind. Oh That’s good to know! Sometimes it feels like I’m always missing that one ingredients so it’s nice to know of substitute options! These cookies are fantastic! I added chia seeds to boost the already healthy-ish cookie and some currants. Oh, yes, yum!!! I’m so glad you enjoyed them Debbie! By the way, thanks very much for the brown sugar tip, it worked! I love oatmeal cookies! These look delicious!